disability of the brain and nervous system. Magnetic Resonance Imaging or MRI for short, is very safe. It is a completely non-invasive procedure. This means that no chemicals or radiation (as is the case with X-rays) are used to create images. Instead it uses a powerful magnet and radio frequencies to create images of tissue in your body. Your child will be gently placed into a device known as an MRI scanner, which is a long tube surrounded by a magnet. The scanner sends and receives signals from the cells in your child’s body. A computer interprets the signals into a set of images that you can see on a computer monitor and then stores the images in the computer for viewing analysis. 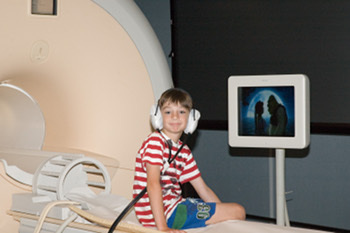 Your visit to Neuroscience Research Australia for the MRI will take place in the later afternoon after school or in the early evening, depending on what is best for you and your child.Your child will be placed on the scanning bed and made comfortable with padding. More padding will be used to help them keep their head still and block the noise from the scanner. For part of the session they may be asked to look at pictures on a screen or answer questions using a keypad, while in other parts they just need to lie still and can even fall asleep if they want to. There will be a microphone where they can talk to the researchers, and the researchers will let them know what is happening. What does an MRI scan sound like? The MRI scanning machine makes some loud knocking or ringing noises when the images are being acquired. Earplugs and foam padding will be used to protect your child’s ears from the noise of the scanner. During the scan, you and one of the researchers will remain in the scanning room with your child (providing that you have nothing that stops you from being in the scanning room). The scan can be stopped at any time if your child is uncomfortable. Your child (and the parent who comes into the room with the child), will not be allowed to wear or carry anything metallic in the scanner room. We ask that you dress your child in comfortable clothes that do not have any zippers or snaps. All objects such as watches, jewelry, coins, mobile phones, keys or anything else containing metal, must be left in the room outside the scanner. Objects containing magnetic data strips, such as credit cards, will have the data erased by the magnet, so they should be left outside as well. Who can have an MRI? Some people cannot have an MRI and should not even be in the same room as an MRI scanner. An MRI machine contains a magnet with a very powerful magnetic force that is never turned off. The greatest risk associate with MRI is from metal that is accidently brought into the room or that is present in someone’s body that interacts with the magnetic field. So no one should enter the scanner room without being carefully screened first. Persons who have a heart pacemaker or any kind of electronic or metal implants should not be in the MRI environment. For additional safety, anyone who might be pregnant cannot be present in the MRI room during a scan.